The "About Us" button and "Before you Order" link provide pricing and payment policies as well as downloads of software manuals. Be sure to check the Updates link (bottom of page) for the latest free updates to MPO software. Generate ephemerides and/or finder charts for any asteroid in the MPC or Lowell databases as well as user-defined elements. Daily calendar shows asteroid appulses with other asteroids, DSOs, and bright stars. Opposition listings for current year for numbered asteroids show you which asteroids are "ready for prime-time". Opposition data for the period from 1995 – 2050 can be generated on-the-fly for any asteroid, numbered or un-numbered. 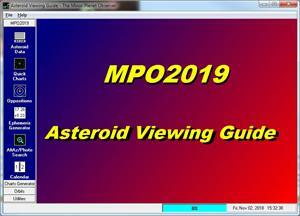 The electronic download consists of a "starter" DVD±R dual-layer ISO image (1)(2) and includes the MPOSC3, APASS (DR-9, MPO format), and CMC-15 (MPO format). The program also supports UCAC4 (native format). The UCAC4 catalog is available as 2 DVD±R dual-layer ISO images for free download(1)(2). Download instructions will be provided via email after receiving your order. (1) The ISO images must be burned to the approriate type of DVD disc before using. Software can also be used to "mount" the ISO images a drive on your computer. There are many programs available, one being Daemon Tools Lite, which is free (with advertising) or $5.99 for a no-advertising licence for 3 PCs. Windows 10 may not require the additional software and will see the ISO images a drive automatically. This must be confirmed before you decide whether or not to purchase image mounting software. (2) Connection and data rates may apply. The starter DVD is used to install all MPO programs. You will be provided with the necessary release code(s) to install only those products that you purchase.